It is a known fact and a reality of life that Canadians pay significantly more for life's epicurean pleasures than our American neighbours: purchasing power parity (the law of "one price") only exists in textbooks, not real life. So when the opportunity arises to purchase a single malt whiskey south of the border we jump at the chance. Which brings us to this week's SukasaStyle Scotch Sunday pick: Bowmore 12-Year Old "Enigma" made specifically for the duty free / travel retail market. For those looking for a characteristic Islay replete with "enough peat that one could eat" this dram may disappoint; that definitely wasn't our view though. 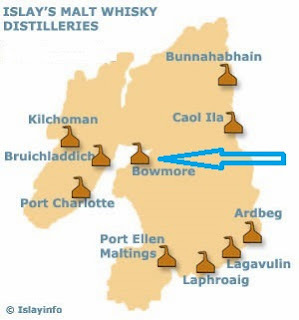 On the one hand, those new to Islay malts should remember that Bowmore is neither a mild nor heavy peaty malt: it is middling on the peat and smoke scale but, on the other hand, this product is a hybrid in the truest sense with a deep, dark colour and a medicinal, peaty nose which is not characteristic of what follows -- is this the inspiration for the namesake "Enigma"? Those who view the products of eastern Islay distilleries Laphroaig, Lagavulin, Ardberg and Caol Ila as true Islay malts must remember that what makes the world of single malt scotches enticing is that each distillery has it own characteristic inputs and the resident malt master play a further hand in the resulting output. The 12-Year Enigma's palate was one of dark chocolate, caramel, and salt. Adding water brings out the sweetness further, multiplies the smoothness and doesn't shorten the already lengthy finish. The medium body and oily character along with the initial nose could mislead but in the end we felt that this was a superbly balanced and smooth dram suitable for a winter's eve. At the LCBO the traditional Bowmore 12 Year is priced at $55 for a 750 ml bottle. The Bowmore 12 Year Enigma at duty free sold for ~ US $45 for a 1L bottle. Pairing: Fine cigar, smoked salmon, scallops, oysters.